Made to classic standards, these Merino Wool Cushioned Foot Shooting Socks are premium quality, made using a 42% merino wool rich blend and impeccably crafted. 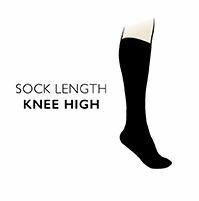 A long sock, coming to just below the knee, and with a deep turn over top, this quality shooting sock is perfection for being fully kitted out for pursuits in the countryside. Hand linked toes for smooth seams enhance comfort and help avoid irritation, abrasion and chafing during long outdoor sessions.